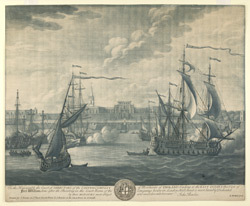 Mezzotint engraving by Elisha Kirkall (c.1682-1742) after George Lambert (1710-65) of Fort William at Calcutta published in London in 1735. This print is after the painting in the Court Room of the Company's house in Leadenhall Street in London. Calcutta was founded on the banks of the River Hooghly by Job Charnock in 1690. In the foreground, there are a number of English vessels, three of which are firing salutes. Behind, Fort William shows two lines of battlements that enclose Government House and over the roof rises the steeple of St Anne's Church, which was consecrated in 1709. The fort was destroyed by the forces of Siraj-ud-Daulah the Nawab of Bengal in 1757. A new Fort William was contructed to the south of the city in Gobindpore and designed by John Brohier.